The FL@33-designed Stereohype T-shirt Password1 was inspired by major security bugs discovered and reported in the news in recent months and years including GHOST, FREAK, Shellshock, POODLE, Gotofail, BadUSB and the probably most widely talked about bug called Heartbleed. We worked on a series of password-related T-shirt motifs playing with selections of the shockingly easy-to-guess 25 most popular passwords used in the last 12 months. 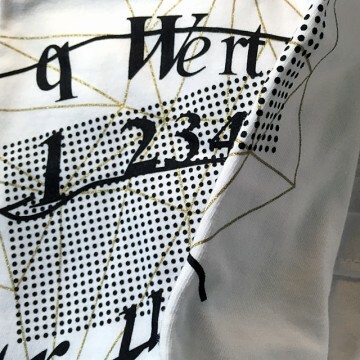 Four of these passwords feature on this limited edition T-shirt – screen-printed with black and enhanced with a heat pressed double hit of liquid gold. The typography is based on the Captcha / reCaptcha aesthetic – scanned and distorted images of difficult-to-read words – a system to prevent automated access to a system by computer programs or 'bots'. Recognise one of the passwords? We recommend that you update your passwords accordingly before purchasing this beautiful Stereohype T-shirt.